Auto-Stop Inc. Automatic Emergency Stop Sign. 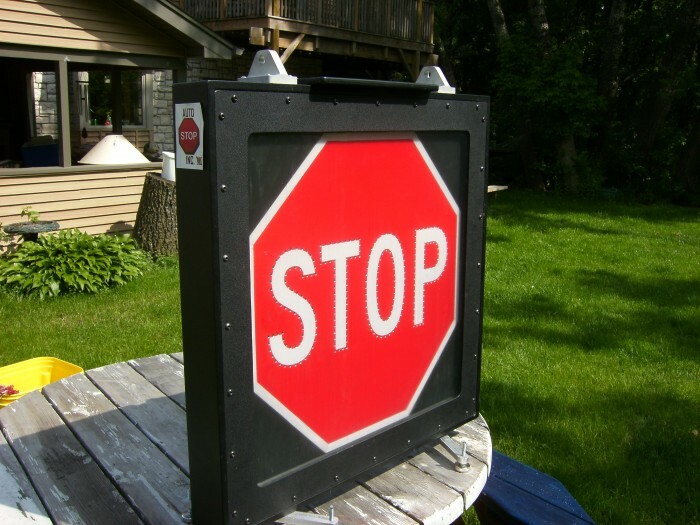 Auto-Stop has developed and built a product that would be used as a traffic control device to be used in the event of a power failure or interruption. It would be installed at intersections that have existing traffic signals. The unit would be installed next to the existing signals, where a drivers eye is normally focused, instead of on the ground and off to the side of the road where temporary signs are normally placed. The sign will automatically display a stop sign the instant there would be an interruption of power making the intersection a four way stop instantly and automatically. 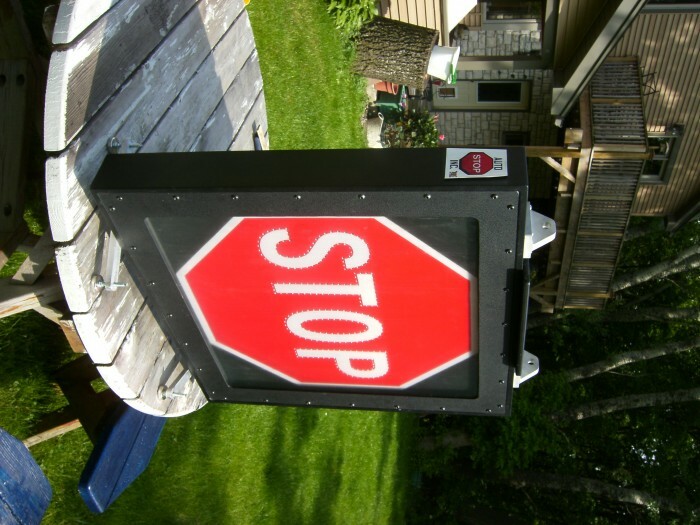 Auto-Stop deploys automatically when power is lost and retracts automatically the instant power is restored, eliminating the confusion of having both temporary stop signs and working signals. There would never be a moment when the intersection would not be controlled. Currently it can now take hours for police or fire personnel to set up temporary stop signs. This device does not use batteries so its effectiveness is indefinite unlike the current systems that rely on batteries and flashing lights. This product when employed uses NO power. It uses gravity provided by Mother Nature making this an environmentally friendly device and a much more cost effective and efficient system than the current battery back up systems. Besides the obvious advantages of reducing accidents and saving lives Auto-Stop would free up emergency personnel to respond to other more pressing situations that usually accompany storms that cause power outages. Auto-Stop would also have an impact on reducing litagation to cities and towns responsible for thier traffic signals and the accidents that occur because of and uncontrolled intersection. Insurance companies would also benefit for the same reason. Auto-Stop has exhibited at a Traffic Engineering show in Georgia and received a very positive response and many inquires from municipalites. We also showed at a highway safety conference in Michigan and received the same positive response. We do have a website that gives more detailed info. Link . We also have a registered trademark. 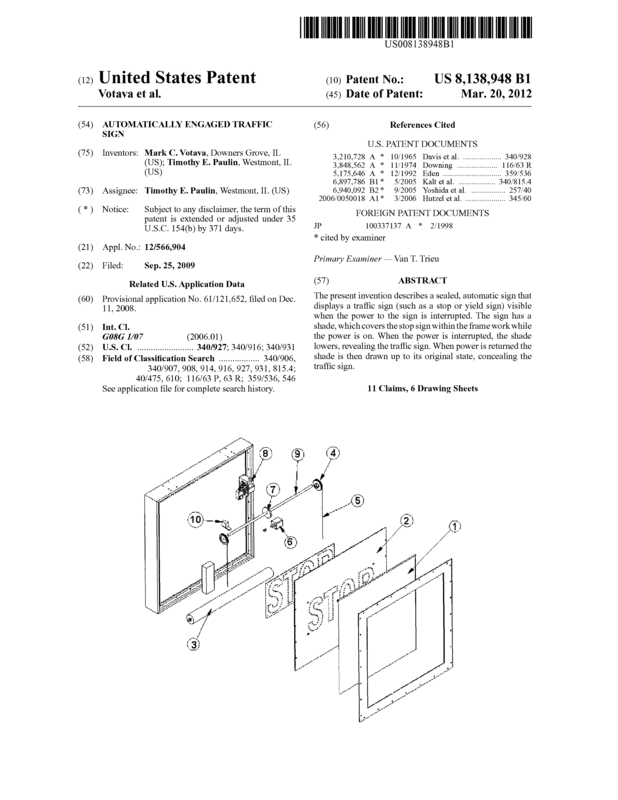 Page created at 2019-04-25 17:58:48, Patent Auction Time.